UPDATE: The guys at TomoNews US have made a cute video about the story! 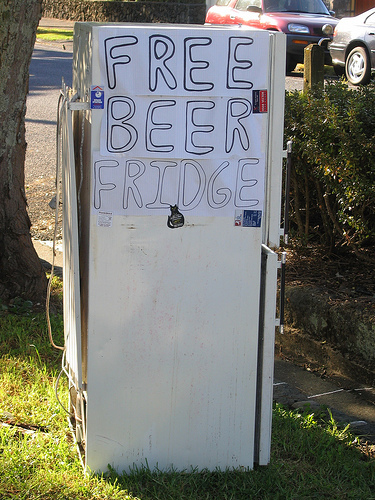 I’m an avid follower of what I term ‘fragile technology’ stories – and so the idea a beer fridge could cause mobile phone network interference across parts of Wangaratta is fabulous. Apparently residents in Wangaratta have been experiencing mobile phone network problems for some time. Telstra’s technicians using software tools and then hand-held antennas finally tracked the interference to a beer fridge in a man’s garage. The fridge is believed to have been interrupting mobile signals in “several neighbourhoods” of the town of 17,000, which lies about 230km from Melbourne. There’s some discrepancy in the reports as to exactly what part of the fridge caused the interference – one says it was the light globe, another the fridge motor. Apparently nobody is blaming the beer – obviously a major relief for anyone who enjoys a cold beer whilst chatting on their phone. Telstra engineers say any electric spark of a large enough magnitude can generate radio frequency noise that is wide enough to create blackouts on the 850mHz spectrum that carries our mobile voice calls and internet data. Mr Jennings says an “enormous range” of rogue appliances can cause disruptions. There’s things called mercury vapour lamps which are often used in retail premises, domestic TV installations is a big one, even large electronic advertising signs can cause interference,” he said. It also seems there’s a big issue with illegal mobile repeaters – to the point I’m wondering how come I don’t have one in my backyard to help out Fiona (who still staggers along with the terrible Vodafone coverage for her iPhone). Seems there’s a bunch of dodgy web sites out there selling these boosters, including ones specifically targeting us poor Australian saps. Although the idea of going to jail for a zillion years for using a repeater may just dissuade me. This entry was posted in Business, Fragile Technology by David Eedle. Bookmark the permalink.